Wegmans is experimenting with new, heartier produce, and new ways of growing it, on over 200 acres of organic farmland and orchards, and they plan to pass that knowledge on to local farmers. On the top of a hill, on a plot overlooking Canandaigua Lake, Wegmans Organic Farm and Orchard is growing 1800 cherry tomato plants. Some varieties are more popular than others. Nate August, the farm's manager, pulls at a golf-ball sized Sakura tomato. He says customers haven't been wild about these bigger varieties. Turn out, people like tinier tomatoes. "If every project was a winner, they'd already be done," August says. "We're not doing it because it's easy. We're doing it because we want to find something new." At this farm, they're constantly testing new organic varieties -- not just of tomatoes, but all sorts of produce and flowers. They also test new ways of growing these foods in a tricky Upstate New York climate, running pilot programs like a giant laboratory. "Other farmers don't have the leisure of doing that because they're busy trying to keep their doors open and produce what they know how to produce because it's less risky," says August. Instead, Wegmans takes on that risk, and can then pass that information on to local farmers that partner with them to become organic growers. 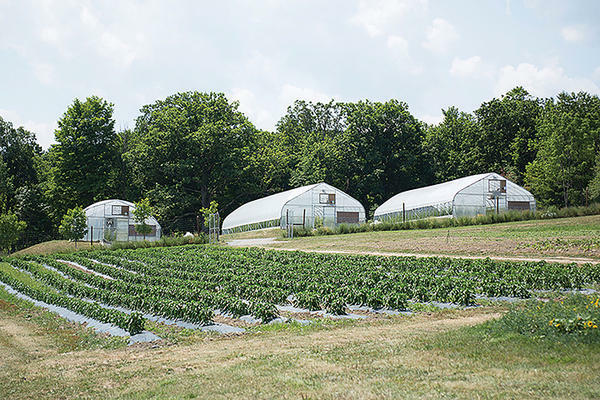 Innovations developed here, to protect produce from drought or rain or disease, pests, and weeds, could also help New York farmers adjust to increasingly varying conditions under climate change.